The Accommodation System (Lens-Retina) is set by your visual environment in diopters -- keeping your vision clear for far and near. A graph translating your visual-environment into the necessary change in the power of the lens of the eye (controlled by micro-blur sensed at the surface of the retina). The lens-retina system smoothly changes the eye's power between two "stop" position as shown above. 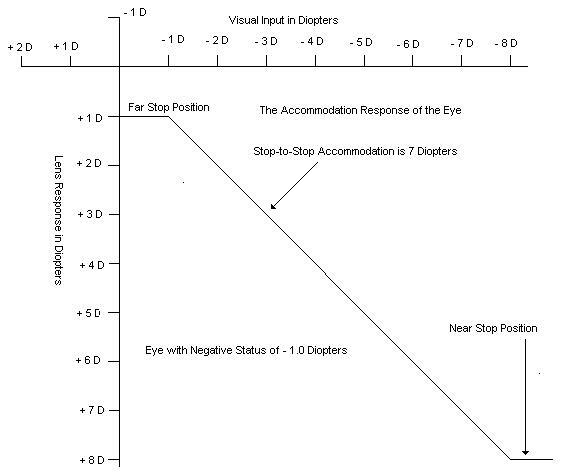 In this graph the eye has a postive STATUS of +1.0 diopters. (i.e., the eye can read 20/20 THROUGH a +1 diopter lens.) The near "stop" position is at -6.0 diopters (or 6 inches). As a matter of convention, parallel rays of light are from infinity, and are classed as zero diopters. All objects closer than 20 feet (6 meters) are classed as a negative environment. 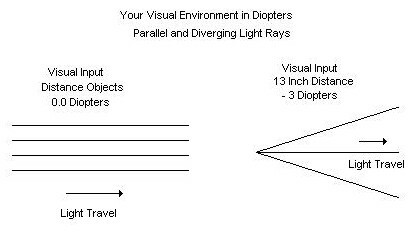 Rays of light through a plus lens are converging, and therefore constitute a positive visual environment as shown on the above graph. 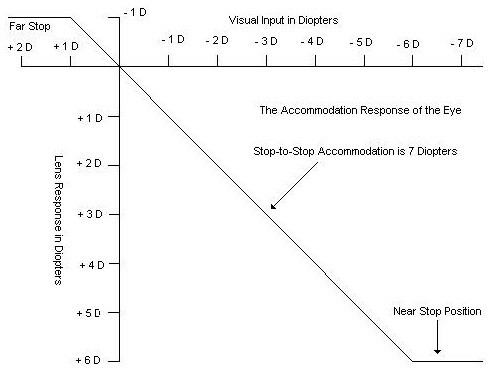 The graph below shows an eye with a negative refractive STATUS of -1.0 diopters and an accommodation range of 7 diopter.